A team of researchers of University of Tokyo have recently developed a wearable that is closer to becoming indistinguishable from the skin, leading to a step further into the future in which such technology may be available on the market. In the paper published by Nature Nanotechnology the method is to obtain these electronic wearables is explained. The wearables can be worn for more than one week without any adverse effects and can be used to monitor health. Scientist Takao Someya said that human skin is very sensitive, which leads to the difficulty of creating skin wearables that won’t harm it. For example, putting a bandage and wearing for a few days will make the skin shrivel. Therefore, some points were considered when developing the technology: the materials forming the wearable should be nontoxic and breathable, made to stretch, light-weight and ultra-thin. 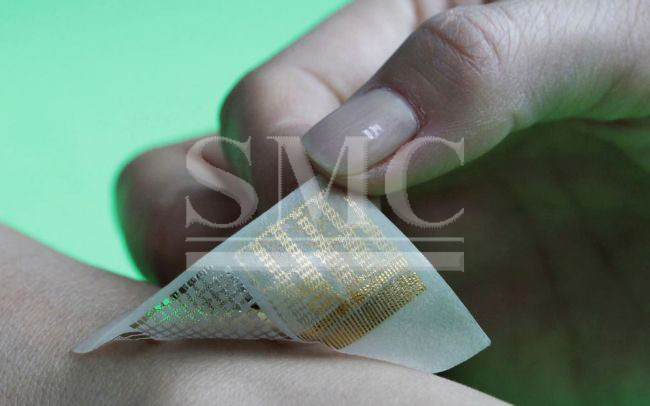 There have been also some other attempts at creating such technology: MIT’s temporary tattoo interface DuoSkin and the stamp-sized circuits developed at the University of Illinois. The downside of those wearables is that they can’t be used for a long time, which narrows the possibilities for which they can be used. Currently those can be used to monitor health for athletes and medical purposes. However, Takao Someya said that his team has engineered an on-skin wearable that checked all of those boxes–nontoxic, flexible, light, thin, and breathable–for the first time. The electronic wearable is made of nanomesh consisting of a water-soluble polymer, polyvinyl alcohol (PVA) and gold, which are all harmless. The wearable can be applied in a non-complicated way: one should spray water onto the material, which dissolves the PVA and let it stick to the skin. At microscopic view, the structure is like a tangle of fibers. The material was found to be durable enough to stretch and return to its shape when applied to fingers. Moreover, it could be used to measure temperature, pressure, and muscle health. The nanomesh is proof that scientists are getting closer to creating technology that will lessen the burden on the body and comfortably monitor the patients or athletes’ states of health.